Ancient Egypt encompasses one of the most exciting periods in World History. 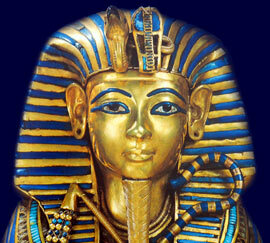 This comprehensive Pharaohs Timeline details the major events significant to lives of the Kings and Pharaohs of Egypt. The timeline commences at the beginning of the first Ancient Egyptian dynasty with the rule of the mysterious Scorpion and Narmer, then moving on to King Menes. The Ancient Egyptian Pharaohs Timeline then goes on to chart the great dynasties and Pharaoh Kings of Egypt including Tutankhamen, Ramses and Cleopatra. Dates of all of the successions and reigns of these Egyptian Pharaohs are detailed, where available, in the Pharaohs Timeline. Facts and information via the Pharaohs timeline. The Pharaohs Timeline details the important people and events, via a simple timeline, charting the key dates in the Ancient Egyptian history of the Pharaohs. Up to 13 kings ruled from Hierakonpolis in Upper Egypt during this period who were known as the "Horus-people" or the "Hawk-people"
Amyrtaeus 404 - 399 B.C. Artaxerxes III 343 BC - 338 B.C. Cleopatra VII Thea Neotera (51 BC-30 BC) ruled jointly with Ptolemy XIII (51 BC-47 BC) Ptolemy XIV (47 BC-44 BC) and Ptolemy XV Caesarean (44 BC-30 BC). Ancient Egypt encompasses one of the most exciting periods in World History. This comprehensive Pharaohs Timeline details the major events significant to lives of the Kings and Pharaohs of Egypt. The timeline commences at the beginning of the first Ancient Egyptian dynasty. The Ancient Egyptian Pharaohs Timeline then goes on to chart the great dynasties and Pharaoh Kings of Egypt including Tutankhamen, Ramses and Cleopatra. Dates of all of the successions and reigns of these Egyptian Pharaohs are detailed, where available, in the Pharaohs Timeline. Facts and information via the Pharaohs timeline. The Pharaohs Timeline details the important people and events, via a simple timeline, charting the key dates in the Ancient Egyptian history of the Pharaohs.